Email servers have different instructions for adding a button image to an email. If you use Gmail as your email server, follow the instructions below to add a "LIVE" Button to an email. View after logging in to your Gmail account. Click this icon in your upper right corner and select "Settings". Scroll down to the Signature area of the form. Click the "Insert Image" icon in the Signature field's toolbar. This will display the "Add an Image" page. Copy the image URL from your Personal Profile or Company Profile for the specific PBX Extension Line you want to use. Paste the image URL in the Add an Image page, here. If you have pasted the image source correctly, a preview of the button will appear below the pasted URL. Click the "Select" button to continue adding the button to your email. 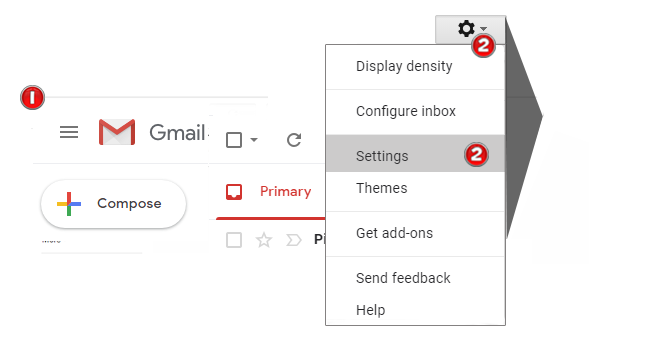 You will then be returned to the Settings page of your Gmail account, where you will now see the LIVE button in your Signature field. To link the button to your Live Video Connector, click the "Link" icon in the Signature field's toolbar. Highlight the "LIVE" Button by clicking over it while holding your left mouse button down. The Settings screen will change to the following. Click on the "Change" link. This will open the "Edit Link" window. Here, you will paste the direct link to your Live Video Connector. You will find this link on your Account Profile or your Company PBX Extension LInes. Copy the link you want to use for your email. If you'd like text to appear when you rollover the button, type the text to be displayed here. If you don’t want any text to appear, leave the field blank. Click the "OK" button to continue. You will now see the button in your Signature field, as well as the destination URL below it. Scroll down to the bottom of your Settings- General page and click the "Save Changes" button. You will now be returned to the "Inbox" page of your Gmail account. Click the "Compose" button to send an email containing your Video Line button. 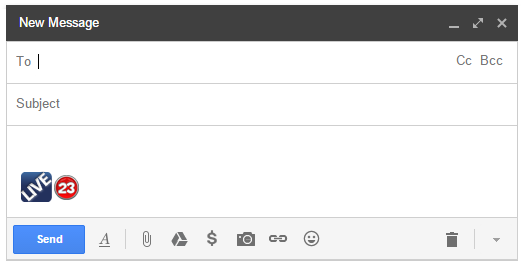 A blank email window will display, with your "LIVE" Button appearing in the body of the email. You can add any content you'd like to the email and your button will remain at the bottom of the email.